India’s most awaited fashion event, Lakme Fashion Week was held in Mumbai this past weekend. Designers showcased their talents and unveiled their spring-summer collection. We saw some really great designers out there, but we were simply bowled over by a few. We can’t wait to share with you our favourite designs of this year’s Lakme Fashion Week. Anamika Khanna is one of the leading fashion designers of India. She is celebrity favourite! Kareena Kapoor acted as a showstopper for her in a sleek black gown and equally sleek hairstyle. Check out those massive ear cuffs! We loved Payal Singhal’s collection. If we had to choose, we’d choose her for the best work showcased in the past 4 days. Aditi Rao Hydari looks so stunning, so beautiful that we just can’t get over her! Ace designer Anita Dongre showed us a glimpse of her collection ‘Songs of Summer’ which was full of floral delights and pastel shades. Ex chocolate boy Shahid Kapoor and his wife Mira Rajput walked down the ramp for her. We vote them to be the cutest showstoppers ever! House of Kotwara’s head designer Meera Muzaffar Ali bestowed upon us her attention to detail and highly intricate work. Former Miss Universe Sushmita Sen was her showstopper. You can’t miss the heavy jewellery worn by her! Jayanti Reddy’s ‘This One Summer’ collection made everyone stop and stare! Shilpa Shetty walked the ramp for her in a heavy ivory lehnega. One of the oldest names in the industry, Shantanu and Nikhil flew down from Delhi to show us some of their finest works. Nawab Saif Ali Khan Pataudi is looking more royal than ever in this black kurta! Anushree Reddy’s collection ‘Pink’ has defined the colours of summer for us. Pretty in pink seems to be this summer’s theme! Look at Sania Mirza looking fabulous as always! Another celebrity favourite designer, Manish Malhotra has made a huge name for himself in the industry. Yami Gautam walked down the aisle for him in a classic black and white saree. This year Tarun Tahiliani’s collection is full of dusty pinks, ivory and pastel shades. Bareilly ki Barfi walked the ramp for him in a light coloured lehenga with huge, deep coloured roses on it. Ashwini Reddy’s label maintains a balance between chic and elegance. Tamannaah Bhatia’s red lehenga has everything one requires- heavy zari work, ruffles and cold shoulders! While Lakme Fashion Week Spring Resort 2018 saw some of the best collections, these were our favourites. 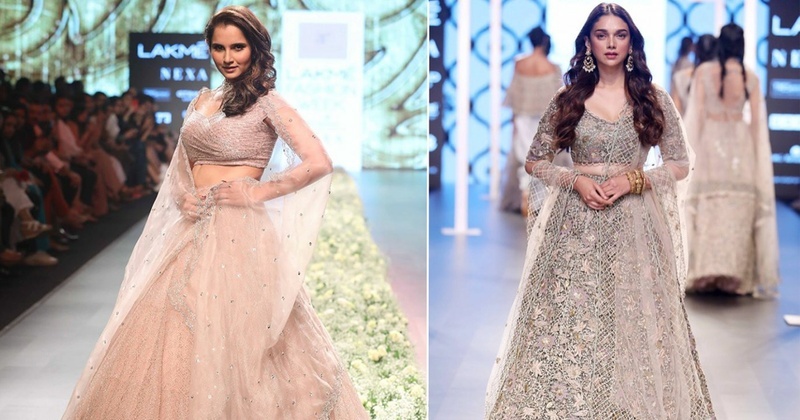 Which one will inspire you for your bridal wear?